I was so excited to visit the birthplace of the Buddha. In my head I had this image of a romantic old Hindu kingdom, locked away and preserved, full of peace and tranquility. …yeah, I was a little off base with that image. Lumbini is not so much a town as a destination, and it certainly retains no sense of being a once wealthy kingdom. Any sense of peace and tranquility was smacked away as soon as we came out of the hills and in the plains of the Terai. Suddenly, the only spiritual experience we were having was cruising along between two trucks and neither being hit nor dying from espixiation. Welcome to the Terai – the land of hot, dusty, and flat. 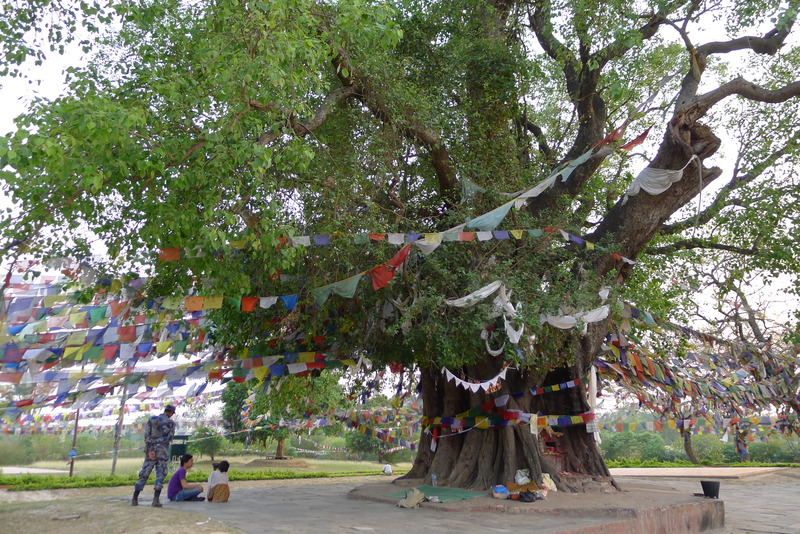 Lumbini itself was mostly a large, dusty park preserving the land upon which they believe Buddha was born. It now serves as a spiritual center and a magnet for Buddhist monasteries from all over the world. Once in the complex, with the Terai safely outside, I stood amongst the ruined stupas in the wide-open field, felt the setting sun on my face, and just listened to the wind in the trees. I was standing in the grass barefoot (no shoes allowed). Off to my left was a young Nepalese girl, holding a Japanese tourist and blue camo covered policeman captive with her wit and charm. I closed my eyes, and for a moment could grasp a small sense of what it meant to be here — what it meant to be standing the exact spot where the Buddha was born. And there it was, peace. As I opened my eyes and began to walk back into the hot, dusty chaos, I vowed to remember that feeling. To remember that if I could find that feeling here, there were very few places where I couldn’t find it again.